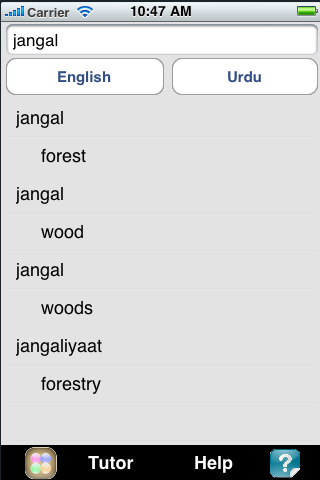 English Urdu Dictionary – travel dictionary to translate English to Urdu displaying a list of matching words in romanised Urdu. The dictionary also translates from romanised Urdu to English. Copying a word from the translated list for a reverse translation can be used to find synonyms and to understand the broader use of the Urdu word in the English language. Although the English Urdu dictionary does not provide definitions or examples, the use of the translation software in this way provides you with a mechanism to better understand Urdu words in the English context without the need for definitions. 30K references. Use the Word Match / Flashcards Tutor learning game to help build vocabulary. Flip between languages and choose to play against essential words or the Advanced 30K reference pairs. Use the Revise option to browse lists of matching words before you play or as 'words of the day'. Ideal for business people, travellers or students.Ideal for business people, travellers or students. 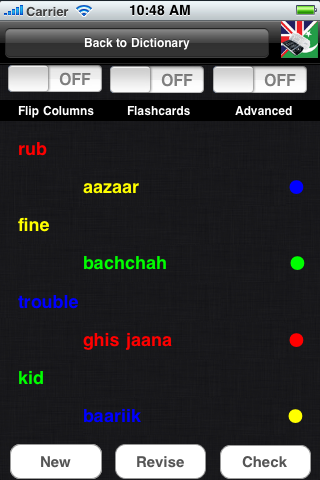 Word Match / Flashcards Tutor learning game to help build vocabulary. Flip between languages and choose to play against essential words or the Advanced 30K reference pairs. Use the Revise option to browse lists of matching words before you play or as 'words of the day'.